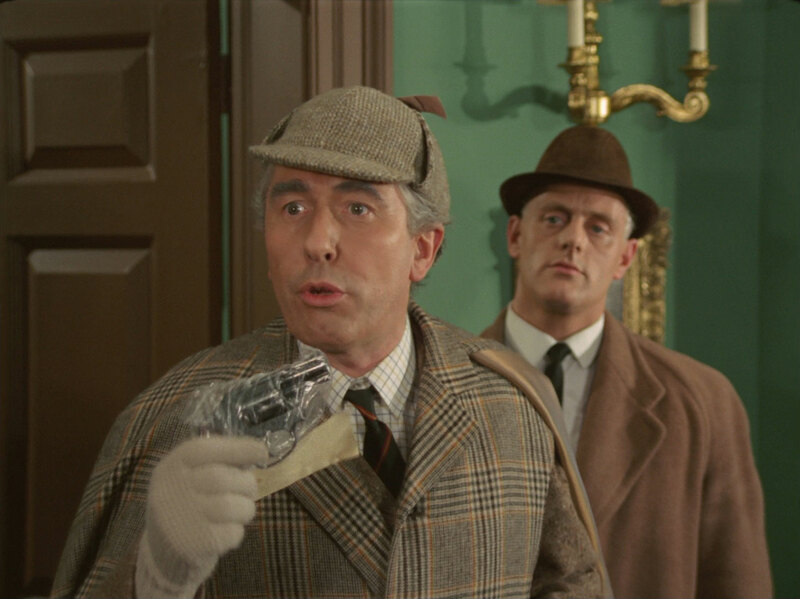 Two trench-coated detectives investigate a murder scene, Earle (Anthony Bate) taking the lead and indicating the evidence to Gardiner (Kenneth Cope). Earle describes the assailant and victim then hurriedly dims the lights when they hear someone approaching. 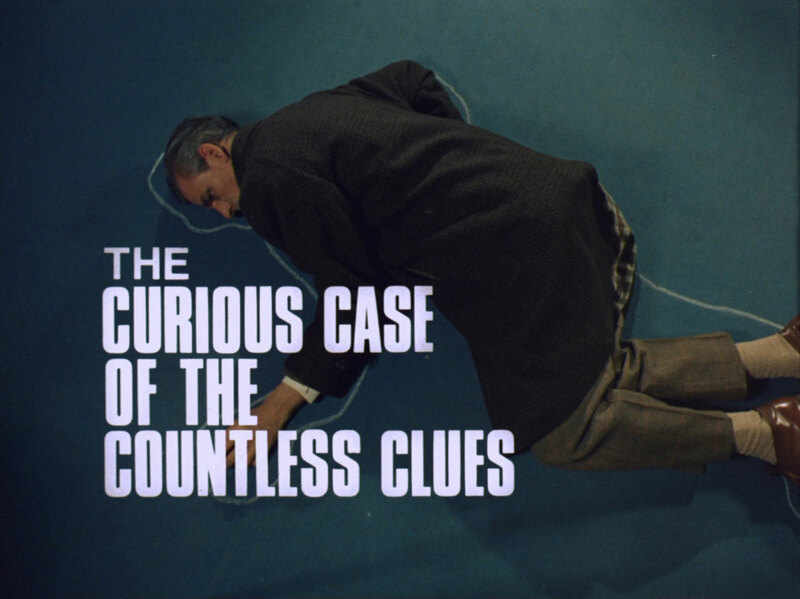 A man (Reginald Jessup) enters the apartment and identifies himself to Earle as Reginald Herbert Dawson. He's startled to learn a murder has been committed in his apartment; when he asks whose, Earle replies, "Yours". and shoots him with the revolver, already bagged as evidence. Dawson falls neatly into the chalked outline on the floor. Tara's wheelchair-bound after a skiing accident so when Sir Arthur Doyle calls, it's Steed who attends Doyle (Peter Jones), dressed in deer-stalker and Victorian tweeds and letting the Holmesian influence get the better of him, at Dawson's apartment. Dawson was a nobody but the evidence points to a cabinet minister, Sir William Burgess. Steed points out the disparities in the evidence but agrees to visit Burgess so they need not send a bobby round. 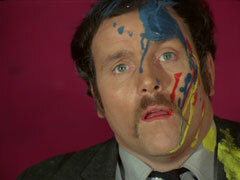 Burgess (George A. Cooper) is edgy and declares he had a break-down at the time in question, however some of his art works are missing from his house. Earle and Gardiner see Steed leaving the house, Gardiner follows while Earle goes inside to see what Burgess has been saying. Burgess declares he hasn't said a word to anyone. 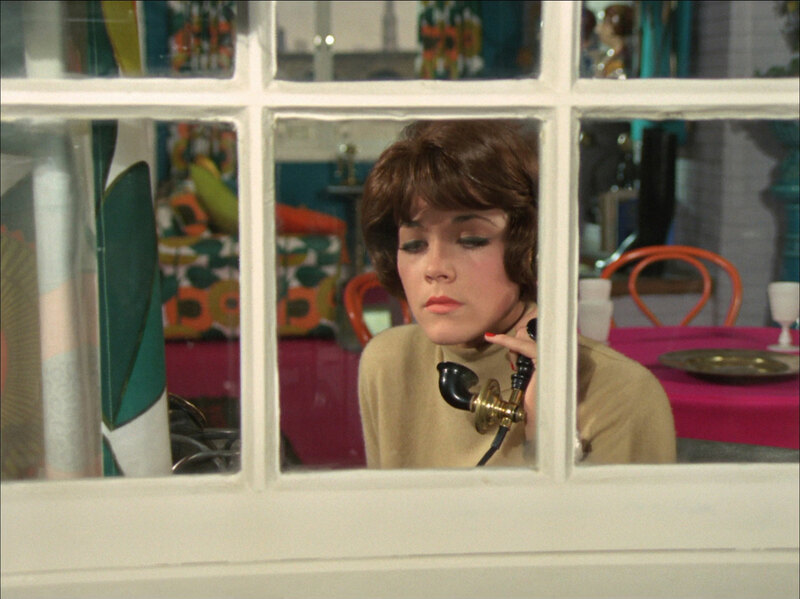 Gardiner follows Steed to Tara's flat - Tara spots him from the window - but is told to move onto Flanders instead. Earle and Gardiner get into a lift with their target and Gardiner pretends to trip, stealing Flanders' handkerchief and a button off his coat in the process. They follow him briefly and Flanders' car breaks down shortly after they take a different road. They switch cars, getting into a Bentley like Flanders', which they put false plates on. 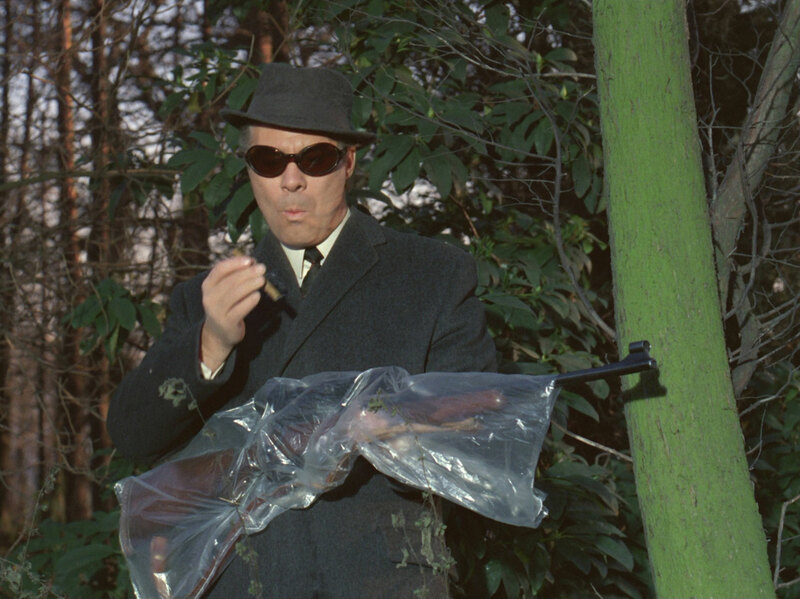 Earle disguises himself as Flanders and sets off with a sniper rifle. Meanwhile, Flanders (Edward de Souza) flags down a tow truck and the mechanic, Stanley (Tony Selby), tells him it's probably a fuel blockage. 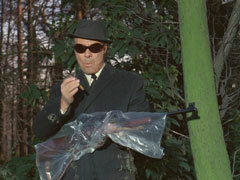 Earle shoots an innocent pensioner called Scott and makes sure he and the Bentley are seen leaving the scene. Steed returns to Tara's, buoyed by a garage confirming they'd serviced a Rolls at the time but is crestfallen when Tara tells him Dawson once worked for Burgess. Doyle calls and summons him to the scene of Scott's murder - Flanders is the prime suspect and Steed was once close to Flanders' sister. Steed pays a visit and is surprised to once more hear of breakdown and recuse by a tow truck. He departs after carelessly enquiring further, meeting the sister, Janice (Tracy Reed) in the driveway. They exchange pleasantries and he departs, watched by Earle and Gardiner, who realise Steed's appearances are not coincidence. Earle enters the house and explains the setup to Flanders, they hand over the crucial evidence of his borrowed hunting rifle in exchange for the Valdesco painting he'd just acquired. Flanders imperiously sneers at him and rings the garage, summoning Stanley to the house. Stanley arrives and reveals himself to be in the pay of Earle and they depart with the painting. Earle revisits Burgess, wanting another Horsborough painting but is thrown out. Burgess rings Steed, wanting to make a confession about Dawson's murder but Doyle gets there first and arrests him. Earle decides Steed will be next - they'll kill Tara to frame him, but first to take another picture from Flanders. Steed comes to and stumbles out to his car. He hasn't gone very far when he breaks down, and Earle and Gardiner set off. He tries to start the car, then notices he has a button missing. He's not surprised when Stanley's breakdown truck arrives towing a car and takes him by surprise as he's pretending to fix the Bentley. 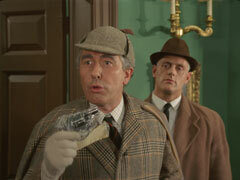 Steed demands the name of the victim, threatening him with the hood of the car. when he learns it, he drives off, stopping at a call box to warn her her life is in danger just before Earle and Gardiner arrive. She drags herself up the stairs and bolts the door just in time; peering through the peephole, she nearly lets Earle in as he's wearing Steed's bowler but checks again and sees his face. He tries the door but retreats when he finds the chain in place. Gardiner meanwhile has slipped in the lower door and the villains gloat over her after she's tossed into an armchair. They set about establishing the crime scene while Tara watches in disbelief, Steed tearing through the night to get there. 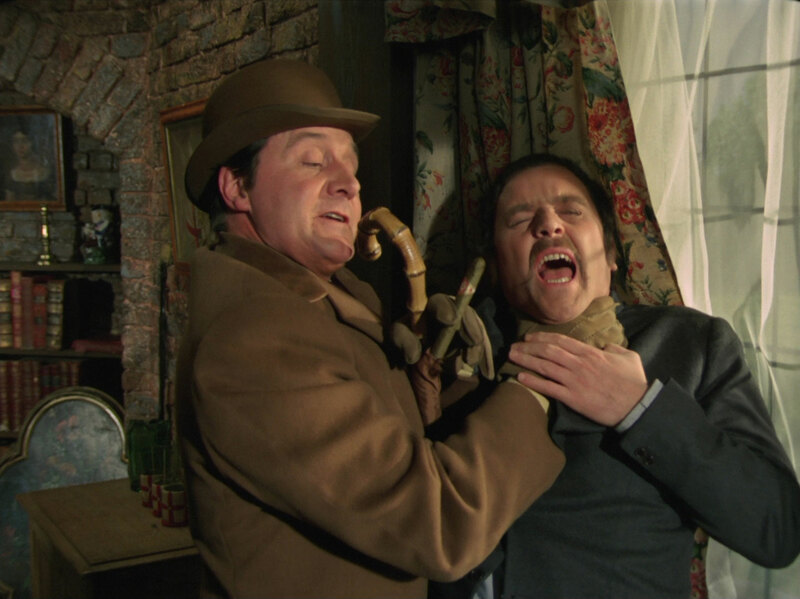 Earle goes to prepare the corpse but Tara squirts him with the contents of her hot water bottle, then throws Steed's bowler at him, knocking him down. Gardiner leaps at her and they parry, she with Steed's umbrella, he with an alpenstock. she prevails and finally knocks him down with her paintbox. she somersaults across the room and grabs Steed's revolver which she shoots Earle with, then fires a few shots at the escaping Gardiner. He exit at the top of the stairs, only to reappear moments later flying backwards and crashing through the railing. Steed enters to find Tara sitting nonchalantly in the armchair, reading a magazine in the midst of devastation. He slides down her fireman's pole and squashes his bowler hat. It's a delicate operation; scissors, tweezers, needle, thread. It's a success, another first for Britain - the world's first brim graft. To prove its strength, Tara somersaults across the room with the brim in her teeth.